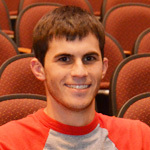 This week’s staff spotlight is on Legally Blonde co-director Sam Steinmetz. Sam, How long have you been a part of the GSHS Theater department? Well, I have been a part of the GSTD for seven years total. Four years was spent while I was attending Gibson Southern High School and the past three years as an assistant of varying degrees. How many shows have you worked on and what kind of positions did you fill? I’ve been involved with about ten productions as a cast member. I’ve been in five as a staff member and I’ve even spent a few as a crew member. My freshman year highlight was “One Flew Over the Cuckoo’s Nest”. My sophomore year was being a Vaudeville narrator and my junior year I was lucky enough to be apart of Les Miserables. For my senior year I was involved in “Wizard of Oz”. As a staff member being part of “Footloose” and the annual tradition of Vaudeville has been great. Being able to be a part of “Legally Blonde” has been an amazing experience, especially. How have you enjoyed being a part of this production? Being a director for this production has been a challenge. But it’s definitely one that I’ve taken great pride in and have had an unbelievably fun time tackling. The cast has been superb and I couldn’t ask for better staff members or crew hands. It’s a real blessing to be part of a department that has students that handle themselves so professionally on stage and are as much fun off stage as they are on stage. Being able to give something back to this department that gave so much to me as a student is something I am honored to do. Sam is currently attending Vincennes University and hopes to enter the Nursing program next fall.